Over one in 10 households in the U.S. spends more than half their income on housing costs, according to new research. In Wyandotte County, it's nearly one in six households. Nor is it news that the health disparities between the two adjoining counties have less to do with individual behaviors than with socioeconomic factors like income levels, jobs, education and long-standing practices such as redlining and predatory lending that discriminate against people of color. What may come as a bit of a surprise is that housing costs – and the financial burden they impose – factor pretty heavily into the mix as well. It turns out that nearly one in six Wyandotte County households spend more than half their income on housing, compared with just one in 11 Johnson County households. In Kansas as a whole, about one in 10 households spend more than half their income on housing costs. The figures come courtesy of the latest County Health Rankings report released Tuesday by the Robert Wood Johnson Foundation and the University of Wisconsin Population Health Institute. The report looks at more than 30 measures to assess the overall health of nearly every county in the country. The 2019 report ranks Wyandotte County 99th out of 102 counties in Kansas (three counties weren’t ranked) for health outcomes, which are based on an equal weighting of length and quality of life. Johnson County was ranked first. The rankings for the two counties remain unchanged from last year. 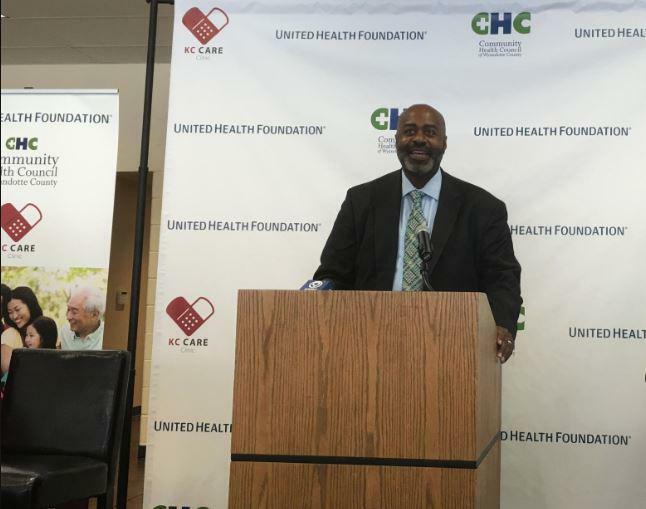 Jerry Jones, executive director of the Community Health Council of Wyandotte County, speaking at a health summit in 2016. This year’s report, which focuses on people’s homes, notes that when too much of a paycheck goes toward paying the mortgage or rent, it’s that much harder to pay for a doctor, purchase medicine, buy healthy food, cover utilities, get reliable transportation to work or school, or meet other basic needs. Combine housing cost burdens with the stress of having to make ends meet, especially if the household is headed by a single parent working multiple jobs, “and there are a lot of things that begin to snowball on top of each other,” Jones says. Add atop that Wyandotte County’s aging housing stock and the environmental issues that go with it, and housing emerges as a major health indicator. The map above shows how Kansas counties ranked by health outcomes. The report isn’t all bad news for Wyandotte County. It shows improvement in a variety of measures, including premature deaths, alcohol-impaired driving deaths, the uninsured rate, preventable hospital stays, mammography screenings and unemployment. On the other hand, the county’s child poverty rate is now as high as 25 percent, the ratio of primary care physicians to residents has fallen, sexually transmitted infections are on the rise, and the adult obesity rate is trending upward. In 2009, the county was ranked the worst for health in Kansas, so the county has made incremental progress. Over the last decade, Healthy Communities Wyandotte, an umbrella group formed in response to the 2009 rankings, has launched a variety of health initiatives, including a push to make the county’s streets more safe and walkable, getting more residents covered by health insurance, reducing tobacco use and addressing “food desert” issues. New county health rankings once again show Wyandotte County as one of the least healthy counties in Kansas. The good news: It’s no longer the worst. Health is deteriorating in many rural counties while improving in many urban ones in Kansas and Missouri. But Kansas City’s innermost urban counties – Jackson and Wyandotte – continue to struggle, according to new annual county health rankings from the Robert Wood Johnson Foundation and the University of Wisconsin Population Health Institute. Alex Smith spoke with University of Wisconsin-Madison researcher Kate Konkle, who was one of the report’s researchers. According to the latest Kansas County Health Rankings, Johnson and Riley counties have the healthiest residents in Kansas again this year. Wyandotte County and a cluster of counties in southeast Kansas remain among the least healthy. The fifth annual County Health Rankings are out, and the parts of Kansas that have struggled in prior years are still at the bottom of the list. The rankings provide a clear picture of just how much health depends on social factors like poverty and education. Johnson County tops the list again this year as the healthiest county in Kansas. Dr. Gianfranco Pezzino, of the Kansas Health Institute, says it’s more than just coincidence that the Kansas City suburb is also the state’s wealthiest county.